Never seen an OC + FC fusion subject yet, myself. Guess I haven't glanced at the fan art very deeply, have I? 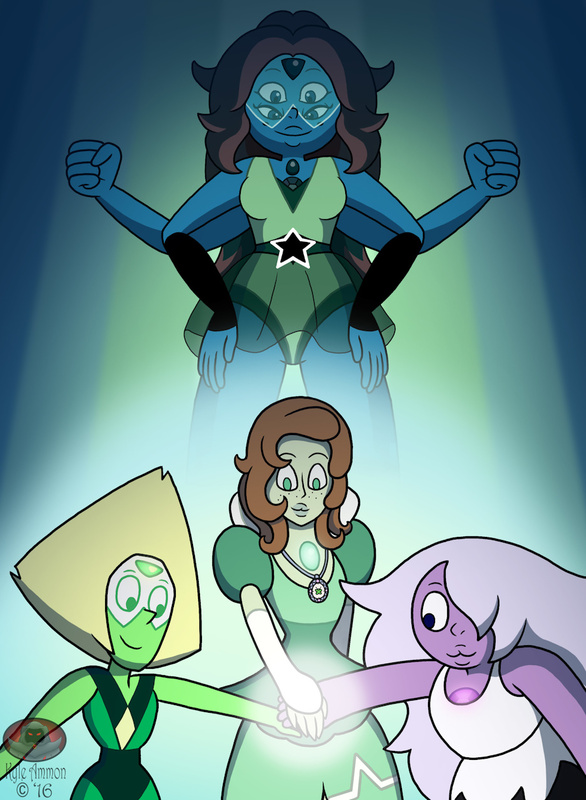 XD Anyway, we've got her FC Gem 'Jade' along with Ame and Peri, who together form the FC fusion 'Labradorite. Man, I just keep learning about stones I never knew existed thanks to this franchise! Gotta say, love the over all fusion design. Got all the usual combined features we've come to know, with a nice unique look overall as well. Thus looks really good. And yeah there are not many Crystal Gem OCs out there. Which is doubly odd after the episode where they crossed over with Uncle Grandpa and Mr. Gus showed off his "gemsona" I mean they seemed to have made up their own word for it but I haven't really seen any.